If you are looking for the most reliable dry cleaner, don't look anywhere else. 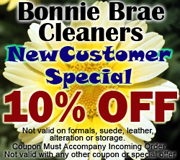 Bonnie Brae Cleaners provides top-notch dry cleaning services at competitive prices. We are proud that we pay special attention to every item, giving you piece of mind and the best dry cleaning experience. We are equipped to provide a wide range of services. Dry Cleaning, Shirt Laundry, Shoe & Bag Clean & Repair, Professional Alterations, Leather, Suede, Comforters, Household Items, Weddings Gown restoration, Bi-weekly Pick-up & Delivery, and much more! !